This movie wasn't really in my "To Watch List" due to the over rated reactions of those who've already seen it. After watching it I could understand the fuss since it was a good watch but it was not exactly the best in my book, it gave me mixed feelings as I went through with it. On another note before watching the show, I didn't really go through the actor list. The only familiar face I knew was Song Joong Ki. To my surprise I found So Ji Sub and Kim Soo An, the little kid who played as the daughter of the main lead in that zombie movie entitled "Train to Busan". Seeing them with diverse character backgrounds made my watching experience more enjoyable. I also discovered a new actor named Hwang Jung Min who caught my attention, his role was the father of Soo An which he acted so well and turned me into a believer of his talents. I'm sure I'll be checking out some of his other movies soon. Story wise the plot was cut in different segments to show several protagonists and their situations before arriving in the same place at the same time, however it was a bit off in some places. As if scenes were inserted here in and there without considering the back story and handing it off to the viewer's imagination instead. I guess that's one of the quirks that I had to deal with while watching films. I need to have a concrete backstory on everything before making a logical conclusion. 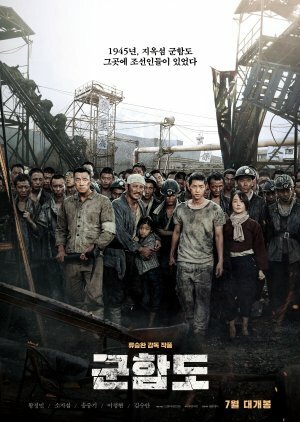 Setting that aside, I still enjoyed it as it was despite having my heart clenched every time I see the hardships of Koreans who were forced to work under the Japanese regime. There was this particular scene that got to me, it was the part where they made a facade for human trafficking by indicating that they were employed. Someone was announcing in the speakers that the Koreans were employed by a certain company all the while they separated the male and female then handed them record books for their payment as they walked off the boat and were guided to their sleeping quarters, rifles were held behind their backs as they walked on. Men had their hair shaved off and brought to the mines while the women’s bodies were checked for any signs of diseases as they were going to be put in the comfort house where they were made into whores. The fact that these people were practically kidnapped, put into slavery and yet the Japanese still say that they were employed… it was a dark irony. That being said I believe that the movie has a serious tone, but despite that it still has its own happy scenes scattered about at unexpected moments. The OST was fitting all throughout its run time. It had all the elements needed to represent how a person’s war torn heart could be put in a melody. I would suggest to wait until the credits part as the song used for it may hit a few cords of a melancholic heart and make a lasting memory about the movie. I’m rating it 8/10 for the way it affected me after I’m done watching. I could still hear the agony during the battle and the cry for freedom of the people who were forced to slavery masked by employment. I may not be rewatching this soon but I am recommending this to people who want to watch a dramatic-action-packed movie and know a piece of history of Koreans during World War 2.